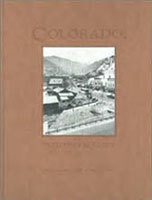 Special deals on Colorado photography books. If you'd like to place an order, please Contact Us. *Quantity discounts can not be combined with other special deals on this page. Corner of book is dented / damaged. Inside pages are brand new. Signed copy from the first printing of the first edition, with leather hardcover. Only 3 brand new, unsold copies remain!